Here goes with the year-end run down, of the most memorable listens and reads during the year 2007. Note that many items here came out in previous years, but it takes time to pick out the worthwhile stuff! Links go to earlier Mediated posts on the subject. Menomena – “Friend and Foe” – pop from Portland that pushes some boundaries, but always keeps a nice rhythmic base. The Shins – “Wincing the Night Away” – another Portland-based band (these days anyway), this CD strikes me as a bit watery somehow, with great production that’s better recorded than live. Spoon – “Ga Ga Ga Ga Ga” – more pop, pared down to the basic elements with great catchy songs. Panda Bear – “Person Pitch” – weird home recordings that channel Brian Wilson into the electronic era. Bruce Springsteen – “Magic” – one of his better efforts in recent years, more varied and lively than “The Rising”, say. I’m Not There – Soundtrack – two CDs worth of Dylan covers, proof that many old gems still have some life to them. Mekons – “Natural” – the old Leeds punks are still at it 30 years later, retaining the “Dark Dark Dark” vision. Tabu Ley Rocherau – “The Voice of Lightness” – compilation of the Congolese superstar from the 60s and early 70s. The Echo Maker – Richard Powers (2006). How a knock on the head could make you another person (and you wouldn’t even know it). Somewhat disturbing reflections on identity, set in the mid-West heartland. The Savage Detectives – Roberto Bolano (1998, trans. 2007). A journey with the young poets of Mexico, as told by those who met them along the way. The End of Mr. Y – Scarlett Thomas (2006). A story of the ‘end of mystery?’ which puts the narrator into the heads of other characters, sort of how a reader enters the head of the author, perhaps. From Hell – Alan Moore and Eddie Campbell (1999). A ‘graphic novel’ of the Jack the Ripper story, with stark black and white drawings that still seem incredibly garish, as fits the crimes. Falling Man – Don DeLillo (2007). A reflection on 9/11 and how it turned people in new directions, some anticipated and some not. The Island at the Center of the World – Russell Shorto (2004). The story of Manhattan in the Dutch years. Shorto argues for the distinctive contribution of the relatively tolerant Dutch in shaping New York City. The Geography of Thought – Richard Nisbett (2003). An examination of different patterns of thought in East and West. The Black Swan – Nassim Nicholas Taleb (2007). How the improbable may be more likely than you think! I Am a Strange Loop – Douglas Hofstadter (2007). Ideas about what we are (I’m not sure if I’m a strange loop though…). A Brief History of Everything – Ken Wilber (1996). An overview of Wilber’s integral philosophy, in Q & A format. If you want more ‘Best of’ lists, I recommend the music lists at PopMatters – interesting choices in lots of genres with good, brief writeups. Christmas Day, 2007. If you’re reading this, then you’ve surely got plenty to be thankful for; the miracle of life itself to start with. While we face surprises and setbacks all the time, the essence of life seems to me to be the daily effort to keep going, to keep trying to reach our goals, to engage with the world. Enjoy! P.S. Just after writing this I look out the window to see a bit of snow falling here in Portland. White Christmas! Such a lifestyle is not only possible it will be much healthier. I think that making this come true is largely about starting to shift mindsets and lifestyles now, so that the transition is not so painful. I’m not quite sure how I’ve missed this concept, but in any case yesterday I learned of the Air Car – a car that runs on simple compressed air! The compressed air moves the pistons, and an onboard air compressor can keep the tank full using very little energy. During the first phase of development, Guy Nègre, thought that he could develop an engine and sell it to the large automotive manufactures. Unfortunately, because adapting an air engine to traditional cars meant changing bodies and production line the large companies refused and he was forced to change his approach. The inventor then set out to develop a vehicle according to his philosophy. This car had to be ecology friend, silence, and practical. As usual, it looks like the big car companies can’t see innovation when it hits them on the head! Last night a few of us trekked over to Gouda to witness the lighting of the big tree in the market square. 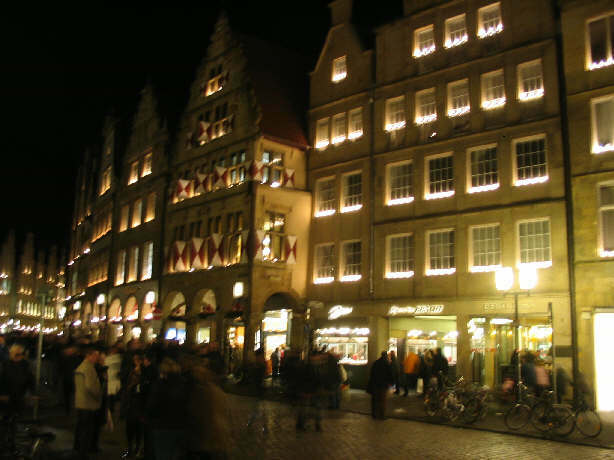 While that was nice, even better I thought was the lighting of the candles in each window of the ancient Stadhuis (town hall, dating back to 1540) in the center of the market, along with most of the windows all around the square. The photo above gives a good sense of it. Also fun to hear “Jingle Bells” and “Winter Wonderland” with a bit of Dutch accent. Bleak. Harsh. These words are actually not strong enough to evoke the world of ‘The Road’ by Cormac McCarthy. I didn’t count, but the words ‘dead’ and ‘ash’ must each appear hundreds of times in the novel. It’s the story of a man and his young son, somehow still alive after apocalyptical catastrophe, along with a few other humans and little else. They don’t have names, but they do have some memories, and they are heading toward the coast, barely staying alive. Despite it all, you can’t help but care about what will happen to these two wanderers, pushing their four-wheeled shopping cart along the road. This is perhaps in exercising how much one can strip away and still leave some recognizable humanity. Or perhaps it’s a reminder of all we take for granted; easy access to food and shelter, safety, cooperation & trust. Or it’s the hope that the next generation will hold the older ones to their best ideals, not let them slip. 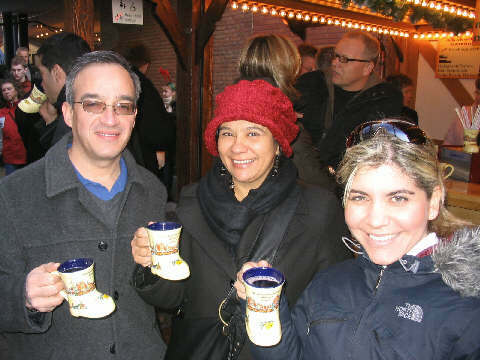 Yesterday a bunch of us made a trek out to Münster, Germany for the Christmas Markets (Weihnachtsmarkt). Weather was about as good as you could hope for on the first of December, clear and about 10 C (50 F). 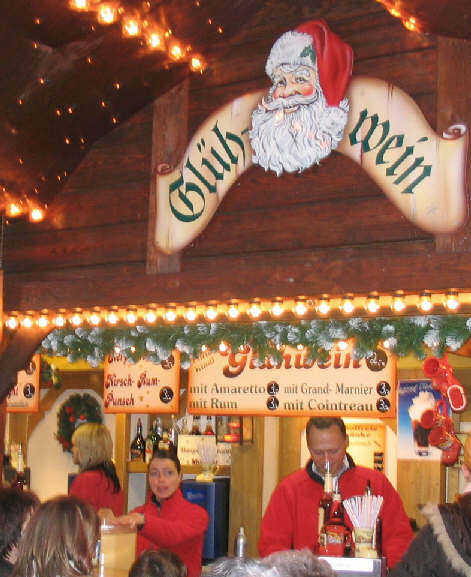 Once we found the market we couldn’t resist one of the big attractions, the Glühwein (mulled wine) served in little boot mugs, with some nice additives available as well. Here are three of my companions over from the U.S., Ricardo & Margarita & Izzet, with their boots. 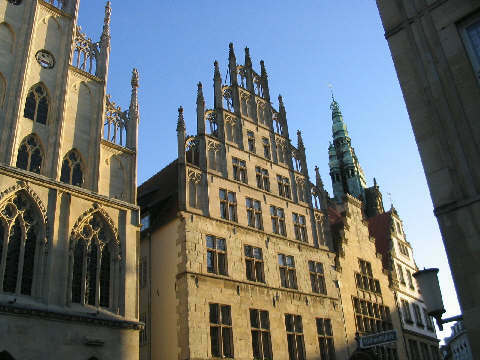 Münster itself is quite a pretty old town, with a main street lined with beautiful gabled buildings. The market goes on well into the night, and the windows are all nicely lit. 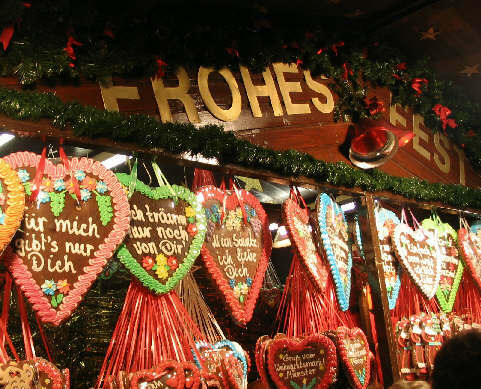 The markets also offer a pretty wide range of gifts; especially nice are these big chocolate hearts!